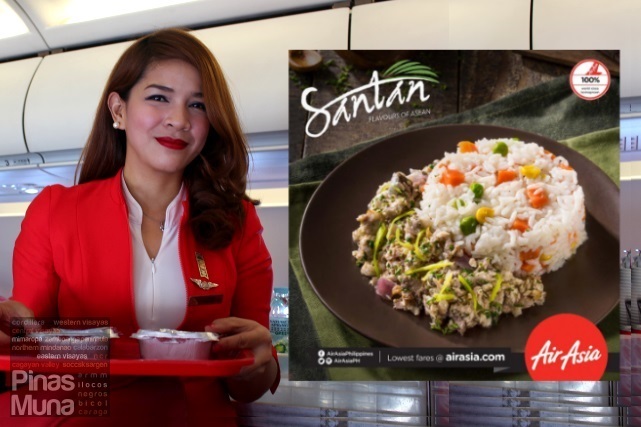 Filipinos who will be coming home to the Philippines this holiday season will be the first ones to have a taste of Philippines AirAsia's new line-up of dishes included in its brand new in-flight menu called Santan which highlights the diverse flavors of South East Asian cuisine. The concept is simple. 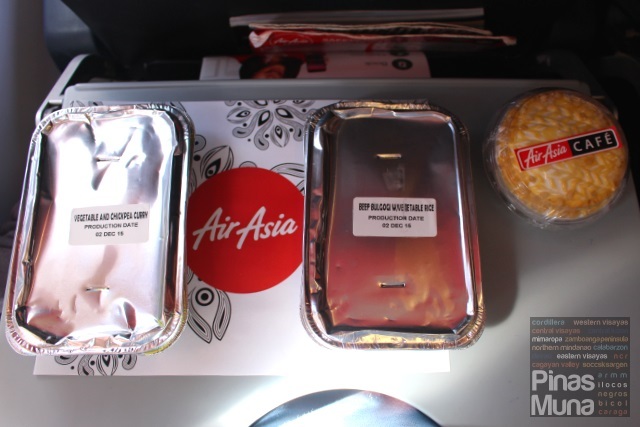 Philippines AirAsia aims to provide its guests with an enhanced gourmet dining experience while flying by making quality and affordable hot meals available for purchase on AirAsia flights. Pinas Muna was fortunate to be among the few bloggers invited by Philippines AirAsia and Vikings Luxury Buffet to try out their new in-flight meals during a trip to Hong Kong. 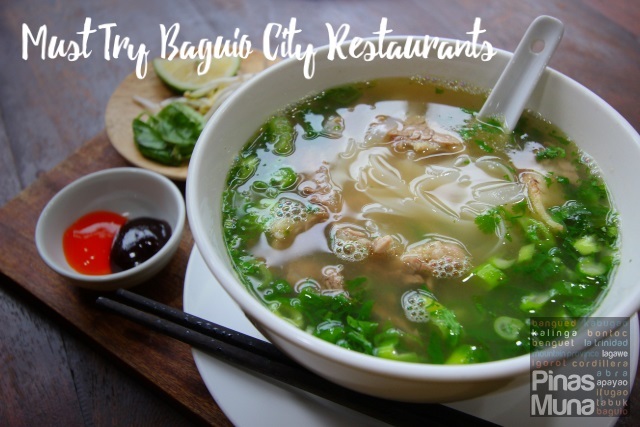 Here are some of the dishes we tried during our flight to Hong Kong and back to Manila. 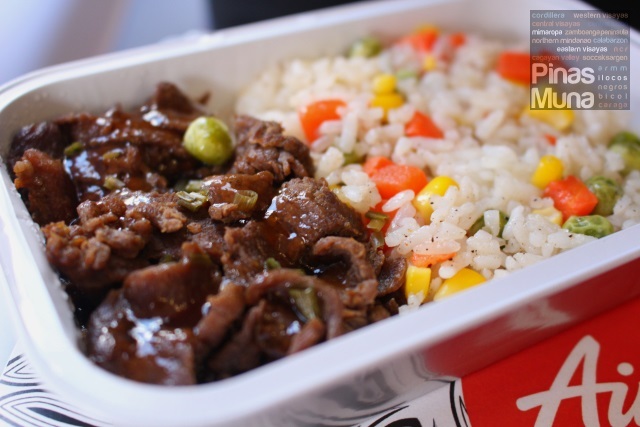 Spicy Beef Bulgogi with Vegetable Rice (P230.00) - This Korean favorite is made of thinly sliced prime cut beef, marinated in a mixture of light soy, sesame oil and spices, grilled and served with rice mixed with carrots, corn and peas. The sweetness and spiciness are well balanced and not overpowering. The beef was tender and easy on the bite. The rice was fragrant and beautifully flavored by the vegetables. 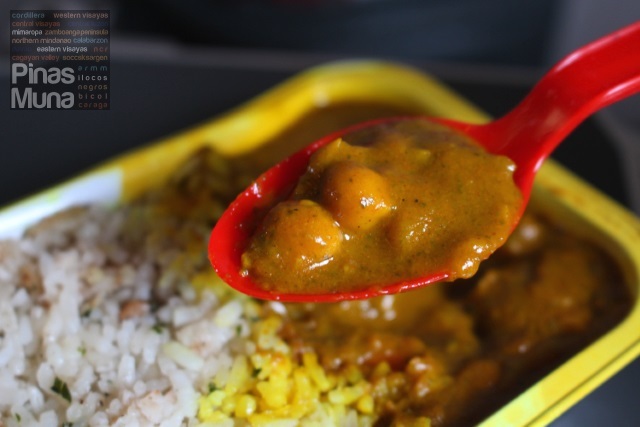 Vegetarian Chickpea Curry (P230.00) - a healthy dish of chickpeas, carrots and potatoes cooked in a fragrant and savory curry sauce and served with mushroom rice. The taste of the dish is very close to the curries I've tried in various Indian restaurants. Though a bit to the milder, the curry still has a slight kick in spiciness. The fragrance was a feast to the senses. It was so flavorful, I wanted to have an extra serving of rice with it. Definitely my favorite! Barbecue Cola Beef with Tomato Rice (P230.00) - chunks of beef are cooked in barbecue sauce infused with cola that gives a savory-sweet taste to the dish. It is served with tomato rice which perfectly matches the stew. The beef are very tender with bits of sesame seeds giving a contrasting crunchy texture to the bite. Korean Japchae (P230.00) - this Korean classic is perfect if your are looking for a lighter meal. This dish is made of sweet potato noodles, stir fried in sesame oil with thinly sliced beef and mushrooms and other vegetables. It is slightly sweet in taste with the unmistakable flavor of sesame and mushrooms spreading at the back of the palate. The thick noodles maintains a chewy and bouncy consistency which makes it very enjoyable to eat, and absolutely addicting. I loved it that the noodles don't stick together, however, I find it a bit oily. 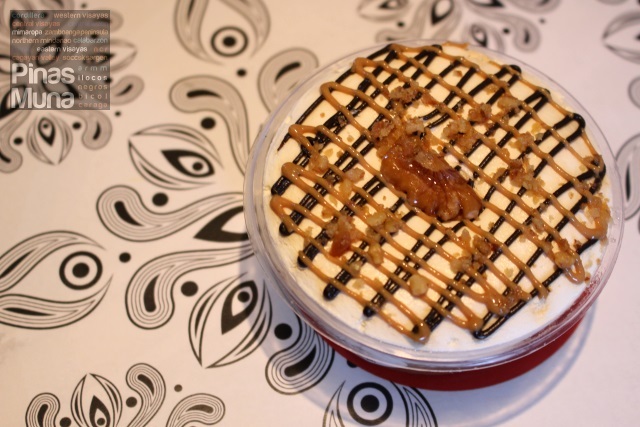 Banoffee Cake (P120.00) - for dessert, I had the banoffee cake which has a very thick and rich base of pie with chunks of bananas, and then topped with cream, layered with chocolate and caramel drizzle and sprinkled with walnut bits. I really loved every scoop of it! My overall flight experience was absolutely leveled up with these sumptuous in-flight meals. 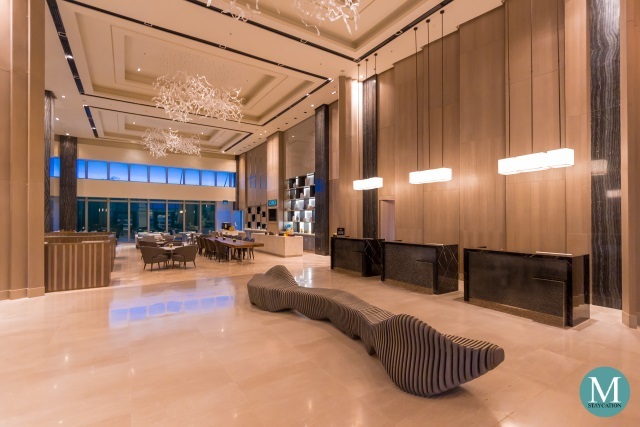 With these gourmet dishes available on board, passengers of Philippines AirAsia flights can customize their in-flight experience to fit their lifestyle and needs. 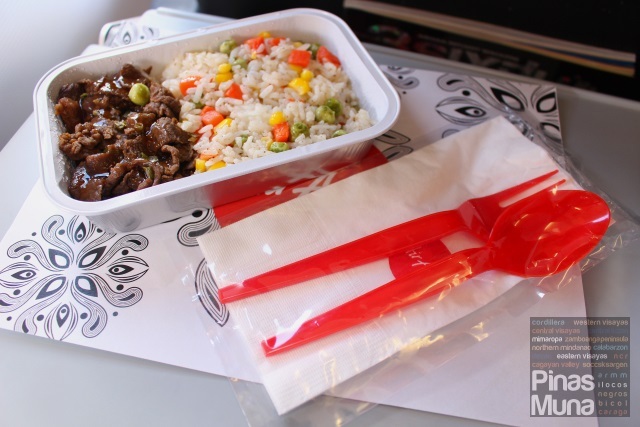 Congratulations Philippines AirAsia for the successful roll-out of your new Santan in-flight menu. The complete menu includes: Pak Nasser's Nasi Lemak, Uncle Chin's Chicken Rice, Bangus Sisig, Buffalo Chicken Strips with Roasted Potatoes, Vegetarian Chickpea Curry, Barbecue Cola Beef with Tomato Rice, Spicy Beef Bulgogi with Vegetable Rice, and Korean Japchae. 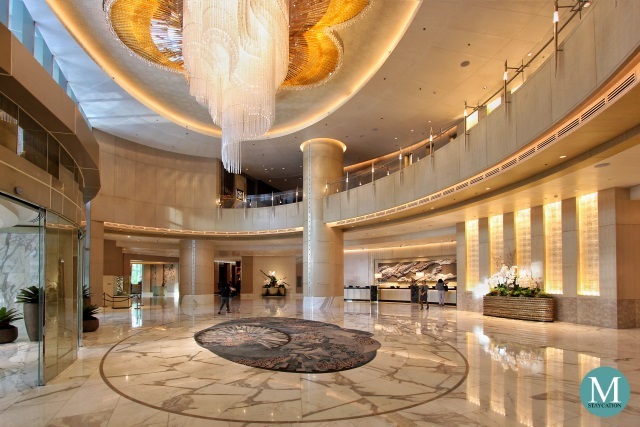 All dishes are priced at P230.00. 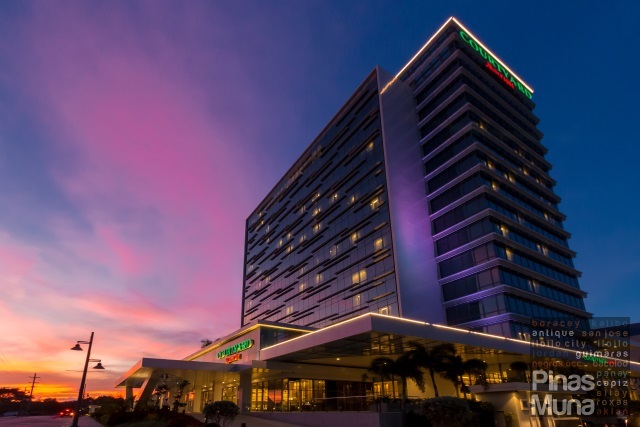 Pre-book your meals and pay only P168.00 which also comes with a complimentary 100ml drinking water. Pre-booked meals are served first on board. You can pre-book your meals by selecting Inflight Meal when booking your flights, or as an add-on to your booked flights via the Manage My Booking section. 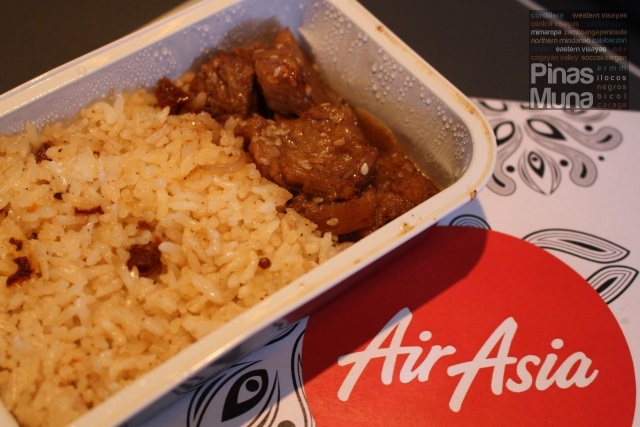 All meals are Halal Certified and are only available in Philippines AirAsia flights of 75 minutes and above (Manila-Davao flight and all international flights). Book your flights now via www.airasia.com. 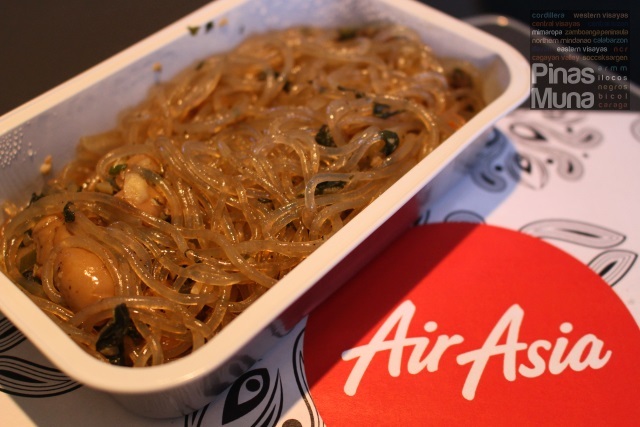 Disclaimer: Flights and meals are provided by Philippines AirAsia. Opinion on the meals are ours and are not influenced by the airline.